Aaaaaaa Easter, a time of year where we seem to end up spending our hard earned money on chocolate and sweets? How many eggs do you buy for your children, I've bought mine one each as I know they will get more from various family members and friends? I wrote a blog post last week showing some alternative gifts that you could buy from Great Gizmos but even then I was thinking do we really need to be buying presents for this occasion? Since then, I've been searching the internet for ideas of things to do at Easter that don't involve spending money. I was one of the lucky people to sign up to Snazaroo and receive a free Easter face painting kit, so the girls will be made into cute little bunnies. 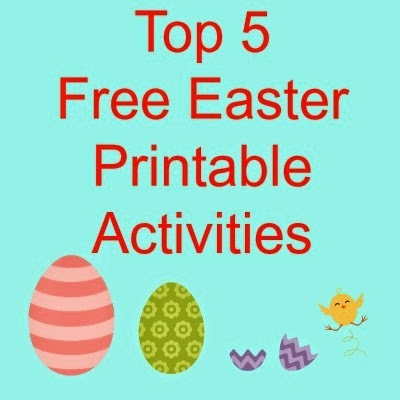 I also managed to find quite a few sites with free printable activities for the children to be doing over the Easter weekend. With so many to choose from I decided to share with you my favourites. 2. The lovely Thirty Handmade Days provides us with a set of worksheets, great for the older kids, still fun but with added learning in there too. 3. Kids Activities Blog provided us with a great idea of creating and designing our own "egg people". 4. Activity Village also had various printables but these Easter Card templates are perfect for the kids to colour in and write to say thank you to everyone who gave them gifts at Easter. 5. Finally Made For Mums have given us several different baskets to build, I've printed out a set to make ready for our Easter Egg hunt.